What's the deal with meat? From sirloins and top roasts to ribs and breasts, it can be tricky to keep different cuts of meat straight, let alone know which is the best option for your specific diet and lifestyle. For most types of meat, more fat means more flavor. If you're looking for a lean protein, go for cuts trimmed to 1/8" of fat or less and remember to add extra seasonings to boost flavor. The U.S. Food and Drug Administration labels beef that meets safety standards (and thus makes it onto shelves) as USDA Prime, USDA Choice, or USDA Select. Don't be fooled by the fancy names, though. The USDA grades meat based on juiciness, flavor, and texture, but it doesn't take nutritional information into account. Cuts labeled "Prime" are the fattiest, with thick marbling (aka layers of fat), tender meat, and lots of flavor. "Choice" cuts are high quality but leaner, and "Select" meats are the leanest cuts with little to no marbling. Every healthy diet requires some fat. And while many previously preached against saturated fat in favor of "healthier" monosaturated fats, recent studies have questioned the popular idea that saturated fat is linked to cardiovascular disease and other health problems. Some research actually suggests a little of the saturated stuff can actually be beneficial to health. Of course, it all depends on what you're looking for in your personal diet, and it's good to know that before hitting the meat aisle. Those sticking to a Paleolithic or low-carbohydrate, high-fat diet may want to seek out fattier steaks and chops. People trying to manage high blood pressure or cholesterol are often advised to pick leaner cuts of meat. Check out the information below to make choosing the right meat for your diet and lifestyle as easy as possible! The great meat debate isn't just about fat content—these days, consumers are considering more environmentally friendly and ethical choices like grass-fed beef and free-range chicken. In terms of nutrition, these options tend to be slightly lower in overall fat and higher in omega-3 fatty acids than conventional meats because of the compounds found in grass and other naturally-occurring grub. Beef raised entirely on grass tends to be a bit tougher and less rich than meat from grain-fed cows. Also, grass-fed beef and cage-free chicken are more expensive than their conventional counterparts. Choosing free-range poultry is largely an ethical and not a health issue—in fact, studies have shown that cage-free chickens are more likely to contract infectious diseases. 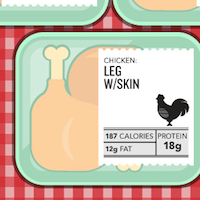 Pay attention to the numbers when buying ground meat, whether it's chicken, turkey, beef, or anything else. Packages labeled as "regular ground beef" in the store can contain as much as 30 percent fat. Take note that cooking with fattier ground meat makes for juicier, moister dishes. If fat intake is a personal concern, stick to the leaner side (90 to 95 percent lean) and look for recipes that get more flavor from seasonings and other ingredients. Ground turkey might sounds like a leaner choice than red meat, but keep an eye on the label. Most ground turkey is a combination of light and dark meat, which can sometimes have the same or higher fat content than lean or extra-lean beef.